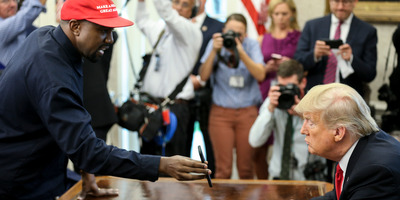 Getty ImagesKanye West and Donald Trump in the Oval Office on Thursday. Seated across from the president at the Resolute Desk, West said he he feels like “Superman” when he wears his “Make America Great Again” hat. Seated across from the president at the Resolute Desk and wearing a “Make America Great Again” hat, West delivered a nearly 10-minute long monologue in which he said he feels like “Superman” when he dons the MAGA hat. “This hat – it gives me power in a way,” West said. While the rapper says he didn’t vote in the 2016 election, he said that Democratic presidential nominee Hillary Clinton’s “I’m With Her” slogan didn’t make him feel “like a guy that could play catch with his son.” West said that because his parents separated when he was young and his wife’s family is female-dominated, he needed more “male energy” in his life. West, who has faced widespread criticism for his high-profile support for Trump and his controversial comments on issues like slavery, bounced from one topic to another, discussing criminal justice reform, an Apple-designed Air Force One, and his own mental health diagnosis. “That was quite something,” Trump added before posing for photos.